Axon Medchem is a top-line chemistry service platform specialized in high quality synthesis of bio-active and/or drug-like molecules; from mg to kg, simple to sophisticated...; no cure no pay policy; we like to meet challenges and we demonstrate you our skills in our catalogue of products. Hit to lead, SAR..., we have accumulated rich experiences in front-line medicinal chemistry research. 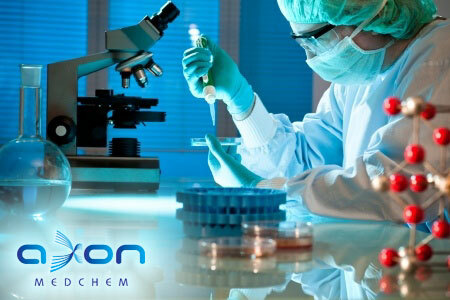 Axon Medchem offers dedicated CRO services in medicinal chemistry. Axon Medchem is active in participating research projects of academic research groups and/or other pharmaceutical or biotech companies. Please contact us for our FTE rates and service conditions. NMR (300-500Mhz), GC-MS, LC or chiral LC, LC-PDA or LC-MS, polarimeters and microanalysis..., for QC of organic molecules, we make use of the state of the art instruments in house or from contractor. APIs, high-profile precursors and raw materials... You can trust us to get you among the best. we provide "One Stop Best Chemistry Solution" for one of your dedicated demands.